MailSite 10.3 continues the work that we started in MailSite 10 to move the most common administration tasks from the Windows and Web Consoles into ExpressPro. MailSite 10.3 expands upon the mailbox administration options already present in 10.2. It brings the ability to manage domain settings together with account creation and deletion into ExpressPro. This means you no longer have to log on to the server every time you need to change a users’ password or create a new mailbox. You can do it all from your browser. For customers who allow their subscribers to manage their own hosted domain, the requirement for a separate configuration site for the ‘Web Console’ is removed. 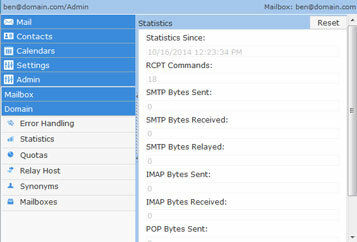 With the release of MailSite 10.3 we have made it even easier for our existing MailSite 10 users to upgrade. We have listened to your concerns regarding the complexity and risk associated with upgrading and have created a lightweight Update Installer. You can use this for upgrading from any version 10.x installalation to MailSite 10.3. The new upgrade installer will not alter any permissions or custom configuration work you have done. It will simply replace the patched MailSite binaries in place and will archive the earlier binaries.